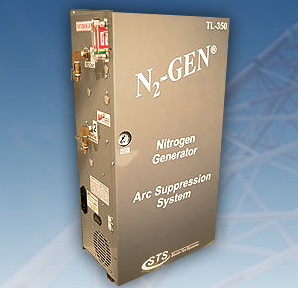 South-Tek Systems offers several solutions for monitoring and measuring your Nitrogen Generator system. Depending on your facility's needs, you may find that some of these solutions will greatly enhance your Nitrogen Generation process. Every industrial Nitrogen Generator manufactured through South-Tek comes with the Performance Verification System. Designed, installed and certified by a reputable third party company, the PVS monitors and logs data such as the exact parameters of the N@-GEN® - Nitrogen Generation System during actual operation in real time. Why is this so important? The PVS provides the customer with a detailed, documented, full load test of their system under their input and output specifications. This can be instrumental in identifying site issues, troubleshooting and maintenance. South-Tek provides the Patent Pending MAP-IT™ Flow and Purity Verification Service to ensure your Nitrogen Generator is maintaining the maximum Nitrogen flow rate and optimum Nitrogen purity for your process. Verifying the flow rate and purity is essential to correctly size a Nitrogen Generator for your installation. Furthermore, understanding the maximum Nitrogen flow rate and minimum Nitrogen purity needed for your process can help you increase savings and conserve your Nitrogen supply. The Patent Pending BlastOff™ Leak Protection System is provided exclusively with Nitrogen Generation Systems from South-Tek. This revolutionary technology is engineered to detect leaks within the external environment of the application. It's also equipped with an audible run-time alarm that sounds when the Nitrogen Generator runs excessively to compensate for the leaks. The BlastOff Leak Protection System can be used in Fire Protection Systems/N2-Blast® applications as well as in restaurant and bar/BeerBlast™ applications. 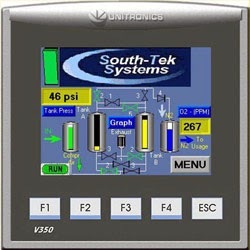 South-Tek Systems provides a wide range of Electronics Controller Packages to help the user monitor and control various aspects of their Nitrogen Generation System. From filter replacement reminders to nitrogen to air ratio conversions and much more, South-Tek offers many standard and optional features to enhance the user's experience with operating a Nitrogen Generator from South-Tek Systems. Before committing to a particular Nitrogen Generator from South-Tek Systems, customers can utilize our Flow Verification Program to determine the best option for their facility's needs. An important component of the Flow Verification Program is the flow meter. This consumer-friendly Nitrogen flow meter was designed as part of our new Flow Verification Program to accurately determine the customer's Nitrogen flow rate requirements prior to purchasing a new generator. The Flow Verification process is fairly simple and non-intrusive, fitting to your Nitrogen gas line. 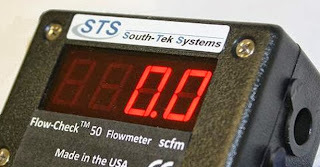 At South-Tek Systems, we understand how important it is to provide our customers with easy to use technology to help monitor their Nitrogen Generation Systems. That's why every Nitrogen Generator from South-Tek comes standard with a full color 3.5" Integrated PLC/HMI touch screen controller. The user-friendly interface allows you to monitor and control a variety of aspects and settings to optimize your Nitrogen Generator's performance. In addition to the many standard features included with the electronic controller, South-Tek can provide a variety of optional instruments and controllers to further provide the user with easy access to a number of settings and operations. Standard features of the electronics controller include filter replacement reminders, incoming air pressure monitoring, Nitrogen storage tank pressure monitoring, visual valve sequencing, on/off toggle switch, and more. A few of the optional instruments and controllers include Allen Bradly PLC with Panel View C300, O2 sensors, pressure dewpoint meter, Nitrogen to air ratio conversions, and remote start/stop. To view the complete list of standard and optional features, visit our electronics controller packages webpage. In addition to these features, South-Tek can also provide engineered to order solutions for your contoller needs. We have full engineering staff support, so we can likely provide you with a specific package that offers just the right combination of options. Whether you need to access specific data or perform full plant system integration of the Nitrogen Generator diagnostics, South-Tek can work with you to customize a controller for your unique needs. You can learn more about our range of electronics controller packages and optional instruments on our website, or by calling 888-526-6284.